The pathophysiology of nausea and vomiting from gastroparesis and cyclic vomiting syndrome often involves autonomic pathways. Nongastrointestinal disorders such as orthostatic intolerance and postural orthostatic tachycardia syndrome also present with nausea and vomiting. Serotonin 5-HT3 antagonists and neurokinin NK1 antagonists are medications to treat nausea and vomiting that also work on autonomic pathways. Gastric electrical stimulation used to treat medically refractory nausea and vomiting modulates autonomic nervous system activity. 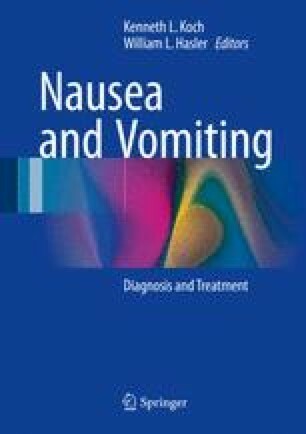 Treatment of documented orthostatic intolerance alleviates nausea and vomiting. Complete autonomic testing or simpler office-based testing may help to identify autonomic abnormalities and to help guide management in these patients. The authors would like to thank Dr. Pradeepa Poudyal and Catherine McBride for help with manuscript preparation. Camilleri M, Bharucha AE, Farrugia G. Epidemiology, mechanisms, and management of diabetic gastroparesis. Clin Gastroenterol Hepatol. 2011;9(1):5–12; quiz e17. doi: 10.1016/j.cgh.2010.09.022. Grover M, Farrugia G, Lurken MS, Bernard CE, Faussone-Pellegrini MS, Smyrk TC, et al. Cellular changes in diabetic and idiopathic gastroparesis. Gastroenterology. 2011;140(5):1575–85.e1578. doi: 10.1053/j.gastro.2011.01.046. O’Grady G, Angeli TR, Du P, Lahr C, Lammers WJ, Windsor JA, et al. Abnormal initiation and conduction of slow-wave activity in gastroparesis, defined by high-resolution electrical mapping. Gastroenterology. 2012;143(3):589–98.e581–583. doi: 10.1053/j.gastro.2012.05.036. Ewing DJ, Campbell IW, Clarke BF. Assessment of cardiovascular effects in diabetic autonomic neuropathy and prognostic implications. Ann Intern Med. 1980;92(2_Part_2):308–11. doi: 10.7326/0003-4819-92-2-308.